Note: Won his first three starts, a maiden at Turfway, an allowance at Churchill, and the Kentucky Jockey Club (G2) on November 26. Won his 2012 debut in a 1 mile allowance March 16 at Gulfstream easily by 7 lengths over Currency Swap. 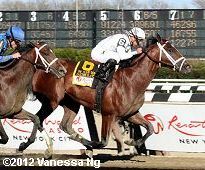 He won the Wood Memorial (G1) at Aqueduct by a neck over Alpha for his final prep. Ran poorly in the Kentucky Derby, finishing 16th.